Robin & Michell recommend working part-time in a tasting room to get started in the wine industry. 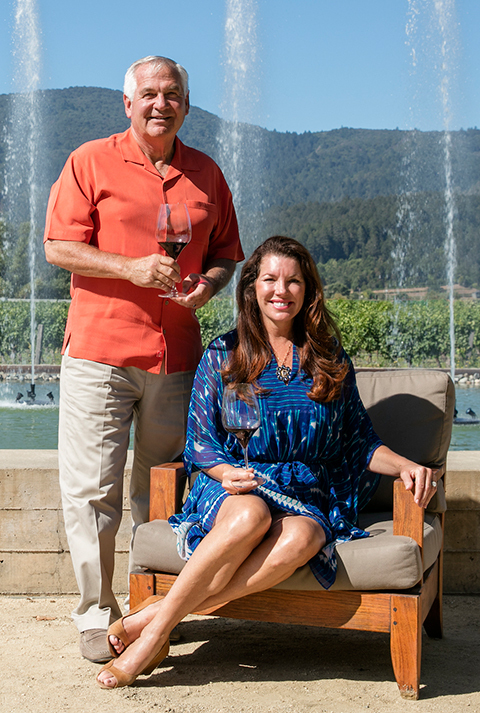 Robin says: I began as a grower on my cattle ranch in San Luis Obispo after I realized that growing grapes in the Edna Valley was more profitable than running cattle. Michelle says: I worked for a marketing company on rebranding the San Luis Obispo Vintners & Growers Association. Working with people in the wine industry, philanthropy and sharing our love of Napa Valley with our customers. Having enough days in the year to spend more time sharing wine with our vintner friends and continuing to hire quality people and putting together a great team. It’s about people. Without people, you don’t have a great winery. We’ve always focused on creating luxurious experiences with a trifecta of the senses centered around our hospitality, sense of place and wine. Climate, the beauty and the wine, of course. We pride ourselves on being Napa Green Land and Winery certified. We also give back to the local community by being heavily involved in Auction Napa Valley, Festival Napa Valley and the St. Helena Hospital Foundation, along with other organizations. Robin says: Playing golf and bridge. Michelle says: Marketing and communications in a full-service PR firm. Michelle says: My mother, father and one of my grandmothers. Work part-time in a tasting room and take wine education classes. For aspiring vintners, you’ve got to have a plan to sell the product. Robin says: I don’t just dress like a cowboy, I am a cowboy. I’ve won several rodeo competitions. Michelle says: I played the leading ladies on stage. I was Nellie in South Pacific and Lady Macbeth in Macbeth.